Posted in Road, Road Bikes, Road Bikes. 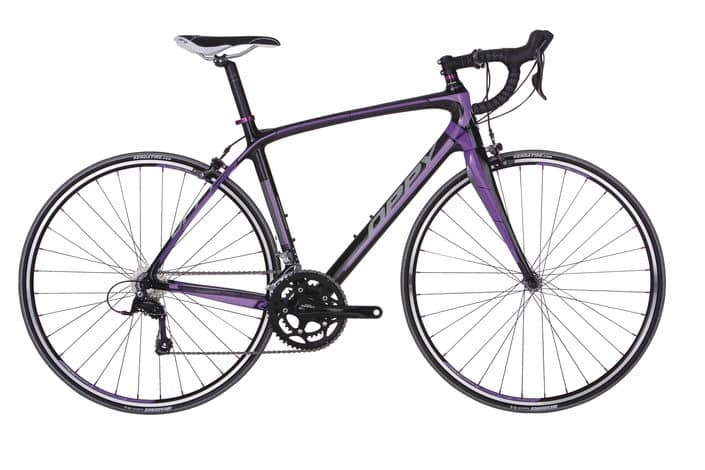 The 2015 Malvern Star Oppy C4 Womens is a road bike. Tight geometry and aggressive rider positioning make the C4 a ride to be reckoned with; the purple color scheme makes it one to be easily found. The light, responsive all-carbon frameset is equipped with top-notch componentry, including a clean-shifting Shimano Sora drivetrain, Tektro’s sure-stopping calipers, and a light Shimano/Alex alloy wheelset, clad in slender, puncture-resistant Kenda Kadence tires, rolling fast and consistent. Zero’s cockpit is sturdy and stable, offering a confident feel in sprints. A very good road bike. T700/24T Multiple Monocoque carbon w/tapered headtube, full carbon press fit 86mm BB & internal cabling. Women’s specific size.